The band scored an out-of-town gig this weekend, so Friday night we loaded up the car and made the trek up to Detroit for a show with our friends the Sons of Adray. 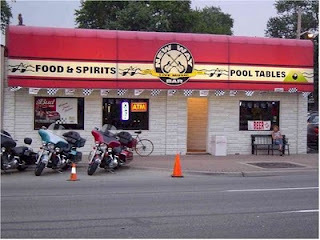 The show was at a cozy little dive called the New Way Bar. The New Way was the perfect spot for our bands’ reunion: dark, hot, and smokey with Elvis and British heavy metal serving as the between band soundtrack and on of the coolest sound guys ever. The beer selection at the New Way is almost exclusively domestic bottles and cans and the liquor shelf was comprised mostly of whiskey. You could pay a few dollars more for a Heineken or a Corona, but then again you could also pay some one to punch you until you felt tipsy. Basically what I’m trying to say here is that the New Way is the quintessential dive bar with an uncharacteristically clean rest room. After playing and sweating and partying into the night and sleeping it off on chairs and couches and floors and the Adray’s drummer’s house we headed back to Ohio sometime around 12:30 or 1:00pm. Our mission for the drive home, besides a safe return, was sweet, sweet sustenance. We began our cruise down 75 South on the lookout for signs of food. Freeway-side signage only pointed the way towards Bob Evanses, Burger Kings, and Big Boys, but when you’re out of town why eat what you can eat at home. We needed something local and new. 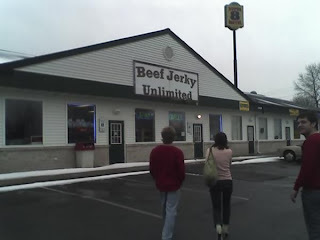 And that’s when I saw it: “Beef Jerky Unlimited, Exit 6.” That sign was all I needed to remind me of the last time we hit the D for a show. On our way back we stopped for breakfast at an amazing little diner somewhere between the Motor City and the Glass City, but all I could remember about it was that it was next door to the beef jerky store. 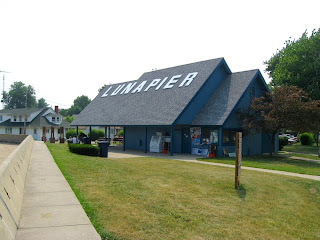 So we pulled off 75 at Luna Pier and made our way to Gander’s Family Restaurant. I have no idea how long Gander’s has been in Luna Pier, but the building and hand-painted sign suggest a long time. The inside, however was updated at some point; the late 80s would be my guess, but it’s a bright, friendly space with booths lining the walls of the small dining room, a few tables in the middle, and a counter that serves as the (gasp!) smoking area. We seated ourselves and ordered water and coffee. The coffee at Gander’s is exactly what a diner should serve: dark, rich coffee that tastes like coffee. No fancy roasts or blends just flavorful, rejuvenating coffee. And thankfully, too, as it seems like it’s harder and harder to find a good, simple cup anymore. Sure, there are a number of excellent local boutique shops in the area and chains like Starbucks offer a great brew, but sometimes a simpler cup is what the doctor orders. Anyways, I’m digressing. Gander’s menu is exactly what one would expect from such and establishment, burgers, hot sandwiches, chicken/steak/meatloaf in the entrees, and breakfast served all day. I couldn’t remember for the life of me what I had last time, but I knew it was breakfast and it was good. I looked over the breakfast page a few times and ultimately arrived on the Southern Sausage Omelet. Filled with cheese and hash browns the Southern Sausage is an excellent foundation for the generous helping of sausage gravy ladled on top. Now, sausage gravy is something I’ve only recently warmed to, but if every restaurant made theirs as well as Gander’s I’d probably be ordering it on everything. Thick, rich, and creamy, the gravy was jammed full of bits of spicy breakfast sausage and the whole thing created a symphony of simplicity when tasted all together. The slight tang of the American cheese and spiciness of the sausage counter-pointed the creaminess of the gravy with the potatoes and perfectly cooked eggs serving as the melody to the more flavorful components’ harmonies. A breakfast at Gander’s comes with a side of hash browns so I go to sample them by themselves, also delicious; brown and crispy on the outside, firm but yielding on the inside. But does such deliciousness and opulence come with a hefty price tag? Not at Gander’s it doesn’t. My check for my food, Joe’s Western Omelet (their most popular item) and two coffees was just a few cents north of $16, not a bad price especially considering I didn’t feel the need to eat again until about 9:30 that night. Gander’s is certainly light on flash and flare, but they more than make up for a lack of fanciness with excellent food, friendly service and a damn fine cup of coffee. This restaurant is absolutely worth the hour’s layover in Luna Pier, plus it gives you an excuse to visit the pier and Beef Jerky Unlimited which offers way more flavors of jerked animal flesh than I could ever imagine (gator or buffalo jerky, anyone?). Anybody else wants a FREE BURGER KING GIFTCARD? Reuntied And It Feels So Good! Bowling Green Food Feast 2010! What's YOUR Favorite Breakfast Spot?